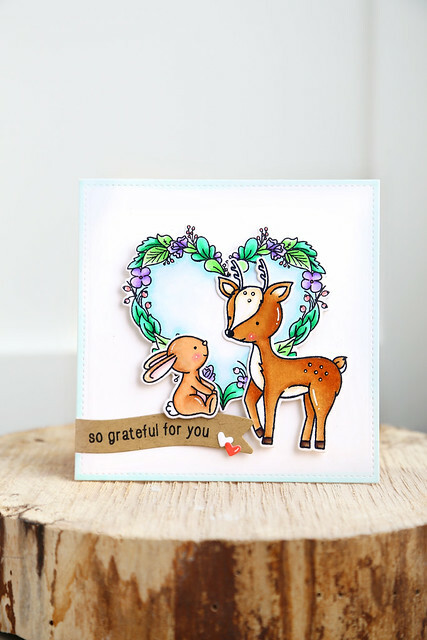 My first card pairs the sweet bunny from Cottontail Cuties with the deer from Into the Woods as well as the Floral Heart frame. I used the wavy banner from Scalloped to prop up the bunny a bit, so that they could stare at each other properly. I love how the little animals work so well together! To add some ground beneath their feet, I stamped the little grass images from the same set, in a way that would stretch to width of my card and used scissors to cut that out by hand. The sentiment was stamped directly onto the card base. 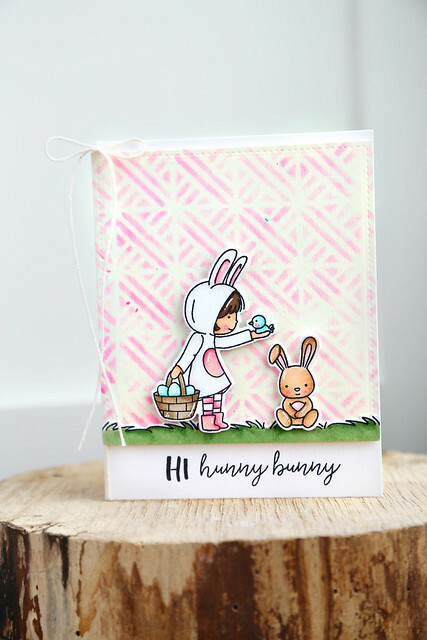 I hope you've been inspired to make a few springtime or Easter cards of your own! 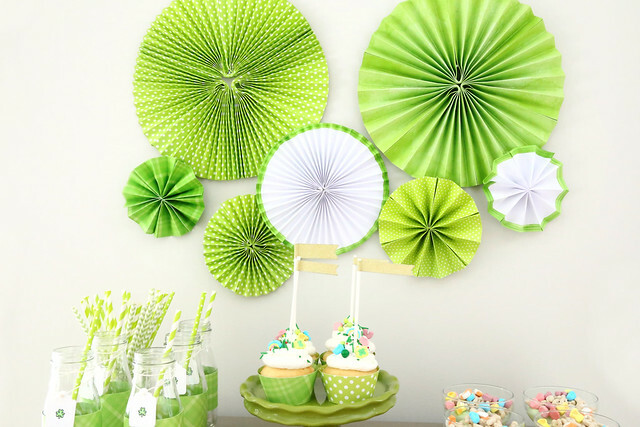 Lawn Fawn and Xyron are collaborating this week to bring you fun inspiration using both companies' products. I've used Xyron's Mega Runner to adhere everything on my card. The Lawn Fawn supply list is a bit longer. I dressed up the Meow You Doin'? 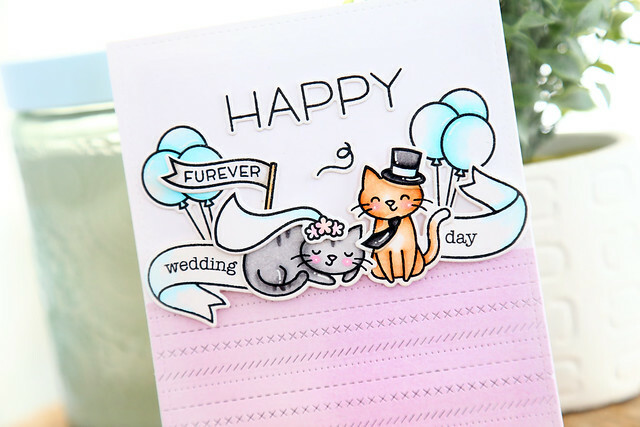 cats for their wedding. I love that my cousin will open the envelope on his wedding day in July and see this and be all WTF, but there you have it. Wedding cats. I'll distract him with a nice, hefty check. ha. The wedding accessories come from the set called Bicycle Built for You, and who knew they would work perfectly on the kitties? I love that "furever" fit perfectly into the little flag. I stamped "wedding day" into 2 Bannertastic banners and snipped them so they could fit snuggly on either side of the happy couple. I'm still giggling, picturing the reaction to these cats. I don't even know if they prefer dogs. 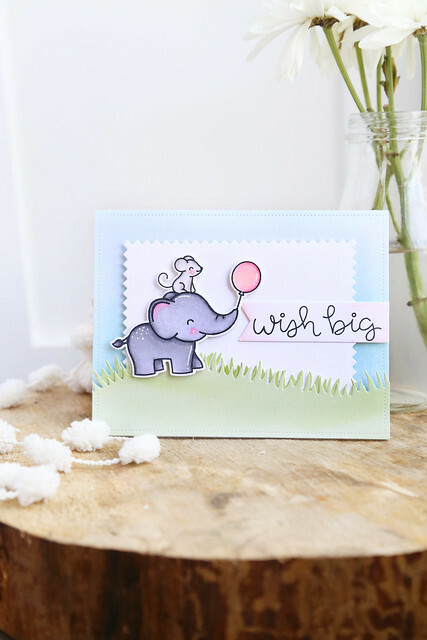 For the last day of Lawn Fawn inspiration week, we're showing off our best pop-up cards, using the new pop-up add-ons. I've used the Grassy Hillside Pop-up Add-on. Maia went to a birthday party and I colored the little girl to match the birthday girl. I love that the girl from Bicycle Built For You can ride the elephant from Elphie Selfie! I will definitely be looking for other critters she can sit on! I hope you like it! It was so much fun to put together. 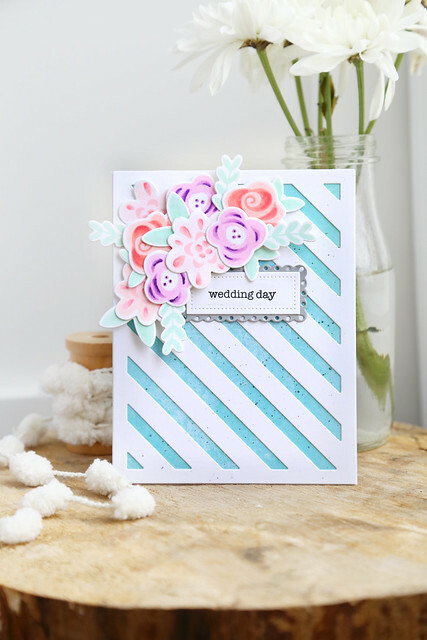 Visit the Lawn Fawn blog for much more pop-up card inspiration - click! This is my second post today - if you're looking for Lawn Fawn, scroll down or click HERE. Are you thinking: gah! more purple? I can't make any promises that this will be the last. I think it's such a pretty color lately! 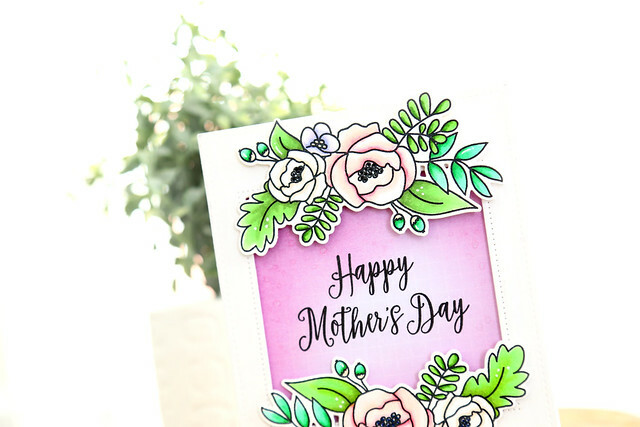 The flowers, from Mother's Day, were stamped twice in soft pinks and greens and used to frame the sentiment. I used the MISTI to double-stamp the sentiment, to make sure that it was good and saturated. I love how it pops. More purple. I really can't help myself. 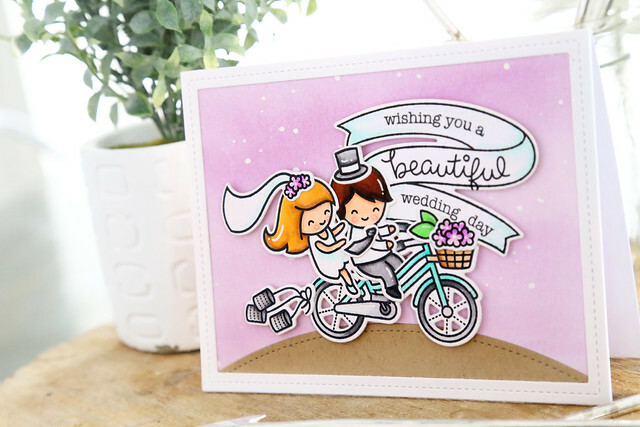 Lawn Fawn inspiration week continues with a closer look at Bicycle Built For You. 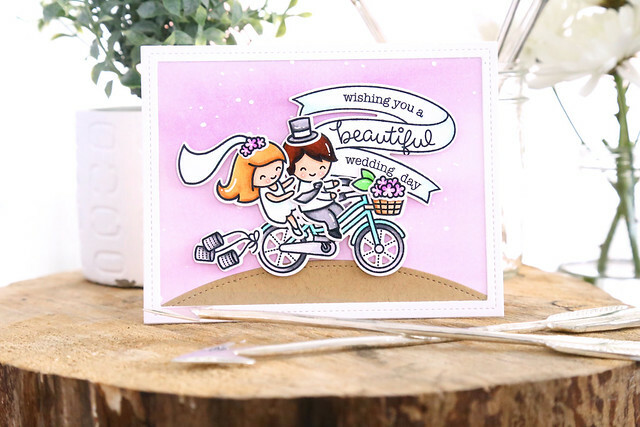 I love all of the little accessories that can take this sweet couple from a casual afternoon ride in the park, to a dressed up post-i-do-can-swinging adventure. I layered all of my images over a sheet of Watercolor Wishes paper, onto which I flecked white ink for a more dreamy look. I then fit the greeting into a sweeping banner, from Bannertastic. I hope you like it! 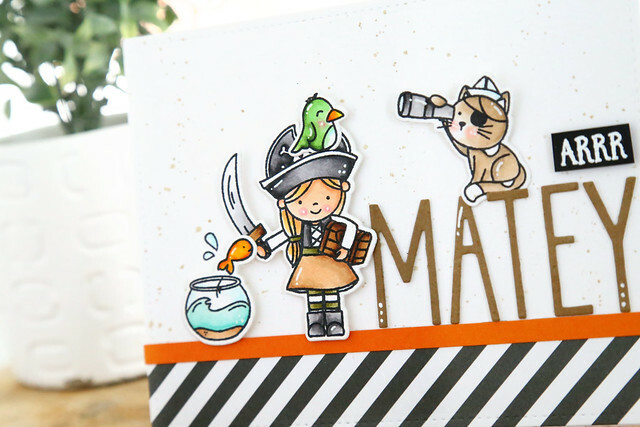 Kelly Marie recreated my card in her video this morning, so visit the Lawn Fawn blog to check it out - click! Hi there, and welcome back to another day of March's Lawn Fawn inspiration week. This is a bit of a quirky card, but a smiley-faced oven is already pretty silly so I ran with it. I used some matching ink to add some shading around the edges of the watercolor paper, and that provided the perfect backdrop for my images. 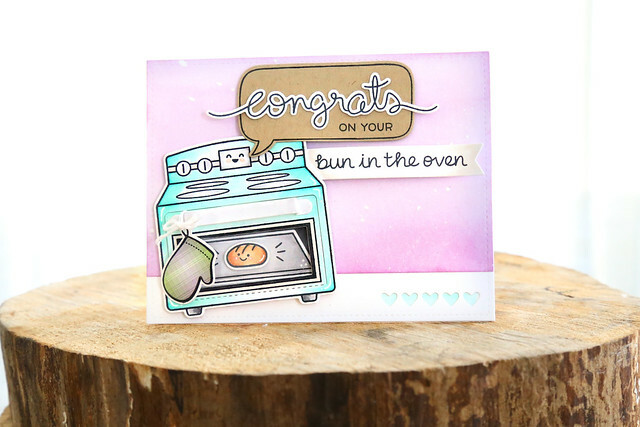 The images are from Bun In The Oven and Sprinkled With Joy. I love the surprise of opening the oven! The little bun looks so cute. I hope you like it! There's more to see on the Lawn Fawn blog this morning - click! 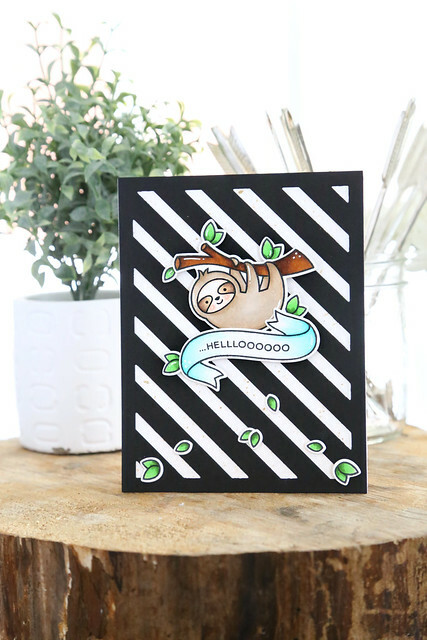 I kept this one pretty simple, The black and white stripey backdrop provides the perfect pop for a more simple card. One little tricky thing I did: I added a few more Os to the end of the HELLLOO - I needed it to look more full in the banner, and I really just thought it'd make him sound extra slothful. It wasn't even as tricky as I'm making it out to be. I inked up the last few vowels only and carefully stamped them on the end. Here's the thing. My cousin is getting married in July, and I've been tasked with making the wedding cards. Allll of the wedding cards. Like, from me, my sisters' families, and my parents. Here's the first. 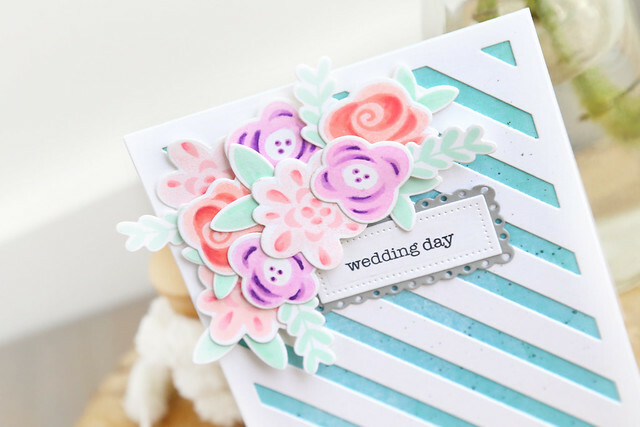 I used Lawn Fawn's Fab Flowers to make this simple (and I hope elegant) wedding card. I stamped the flowers in soft ink colors (stamping off onto a piece of scrap paper first so that the solid image would be even lighter.) Then, I added some loose shading with copic markers. The inks are water-based, so there was some bleeding, but that was part of the look. I hope you like it! 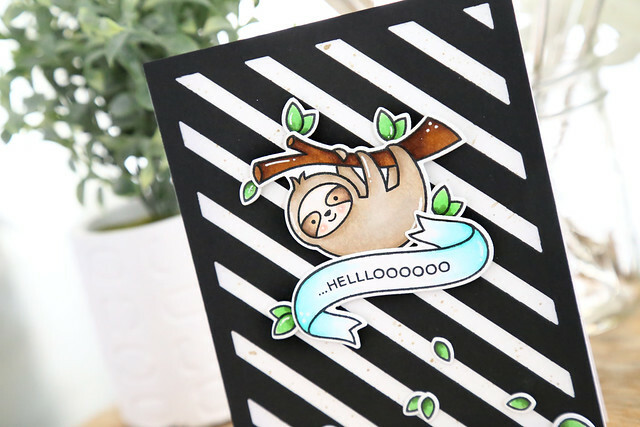 Kelly Marie recreated the card in her video this morning. If you'd like to see how it was made, head over to the Lawn Fawn blog and check it out - click! It's day 2 of this month's Lawn Fawn inspiration week, and we're showing off a few new sets. I've focused on Bannertastic, and built my card around the sweeping banner. 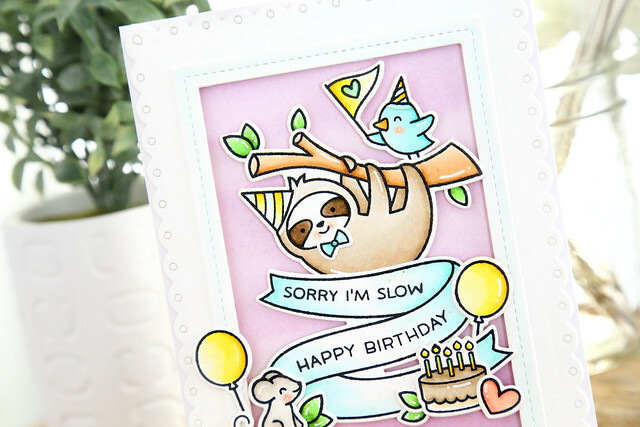 I've set up a birthday scene with the sloth from Hang in There, as well as the bird and mouse and other accessories from Elphie Selfie. I backed everything in a sheet of purple watercolor paper, and frame it out with a Fancy Scalloped Rectangle Stackables die. To note: I'm calling this week My Purple Period, because in editing my photos I realized that half of them feature this pretty purple watercolor paper. I've used it all up already. ack. It's so pretty though! Be sure to visit the LF blog this morning to see what the rest of the design team has created - click! 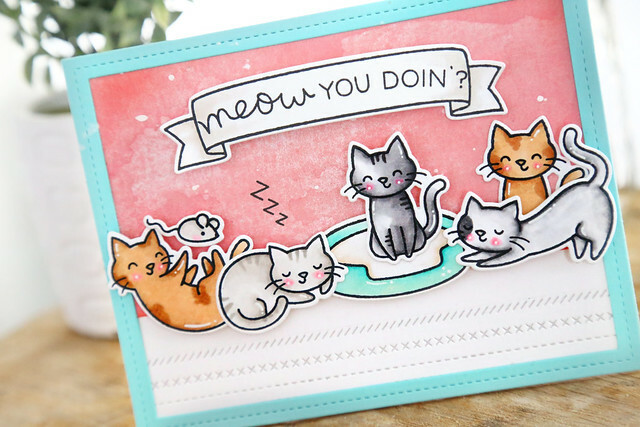 We're kicking off Lawn Fawn's March inspiration week with a closer look at Meow You Doin'? 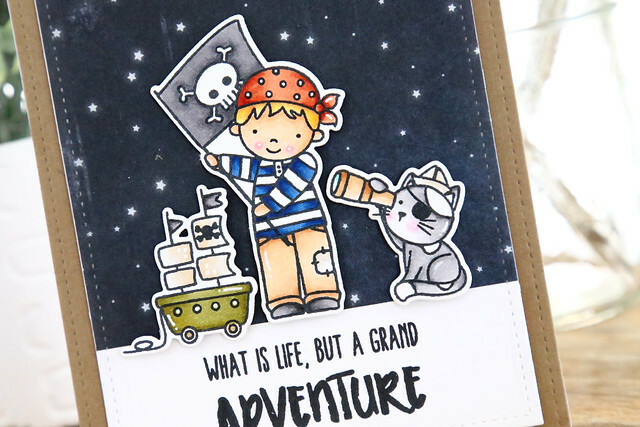 I shared this card back in January, but Kelly Marie recreated it in her video today. 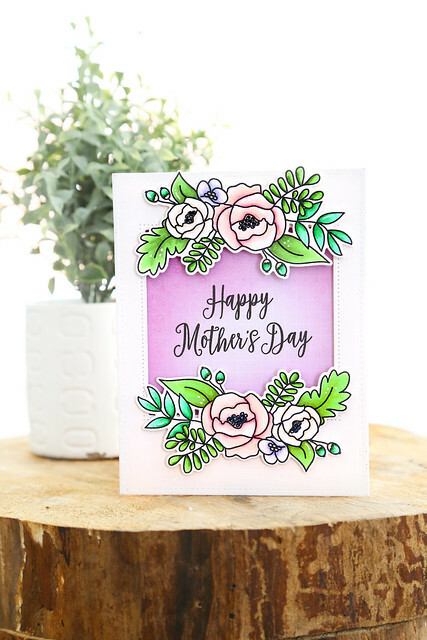 If you'd like to see step-by-step how to create this card, visit the Lawn Fawn blog this morning - click! 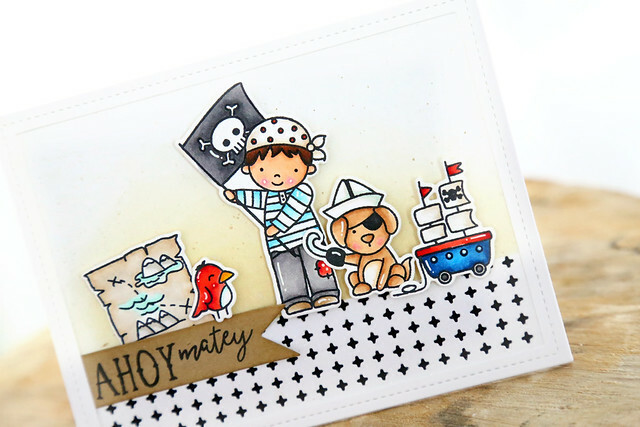 I'm on the Neat and Tangled blog this morning with this little number, featuring the pirates from Yo Ho Ho. I hope you check it out for more details - click! The Neat and Tangled new release is up in the shop - CLICK! I thought I'd recap the many Yo Ho Ho pirate faces I've shown off this week. And don't worry, there will be more to come! I really love these little guys! Thanks for all the sweet comments throughout the week. I can't wait to see what you do with them! 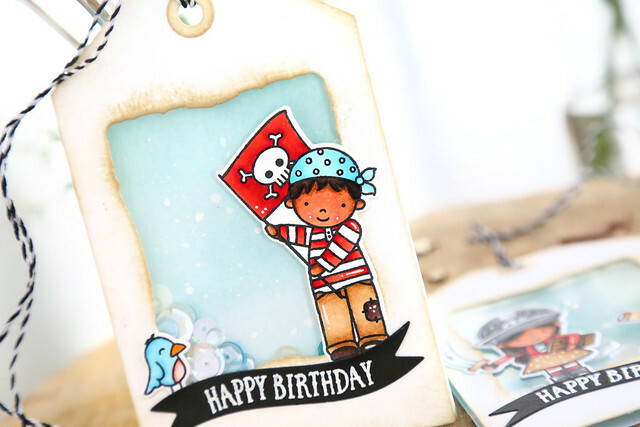 I'm using a new die set designed by Miriam for Neat and Tangled: the Classic Tag 2 dies. 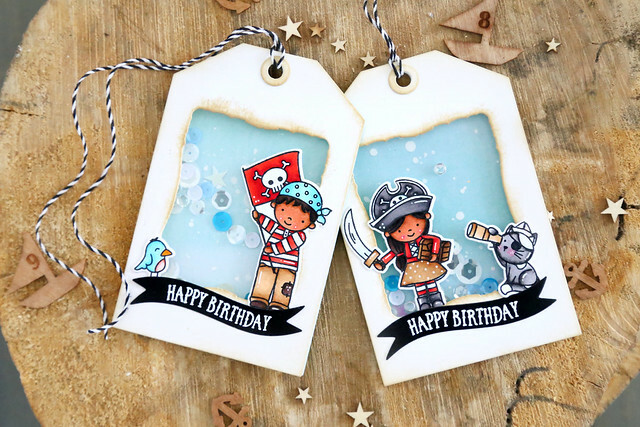 The tag size is large, but not too large, perfect for getting creative with other dies, or for scene-building! For my tag, I cut an opening into each one using the rectangle Ornate Frames die. It has a wavy, irregular look that reminded me of a vintage treasure map! 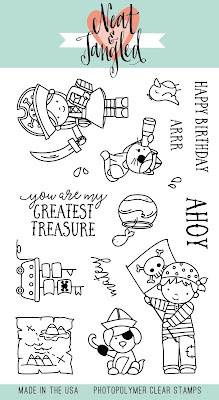 I couldn't help but make the tags into little shakers, and I heat-embossed the happy birthday sentiment onto black banner flags from Scalloped. Everything new goes on sale tomorrow morning! Check out the Neat and Tangled blog this morning to see what the rest of the design team has made - click! This is my 2nd post today. If you're looking for Lawn Fawn kitties, click HERE or scroll down. We're back with another day of Neat and Tangled new stuff. 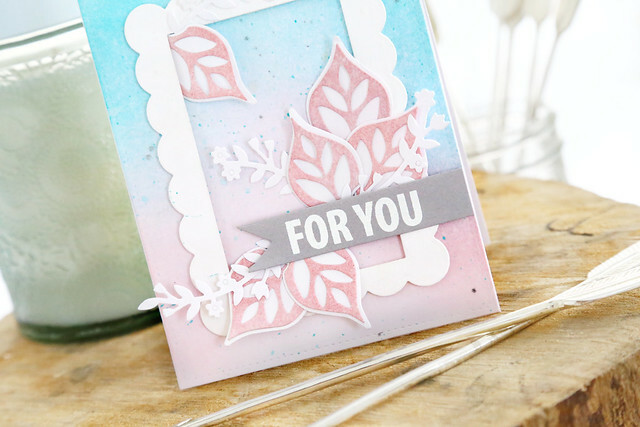 Today, we're showing off Miriam's new set, Medallion Flower Builder. I opted to use the dies only for the leaves, sponging ink onto the more detailed layer. I love how the dies can be used on their own! I used the Scalloped dies to make a frame, and cut up the Hooray wreath to have sprigs sticking out, to soften the look of the graphic leaves. The sentiment is from Medallion Flower Builder, and white-heat-embossed onto a strip of grey cardstock. Lawn Fawn is partnering with ScraPerfect this week, using their wonderful adhesive products. I used The Best Glue Ever to put the crowd of cats onto my card. 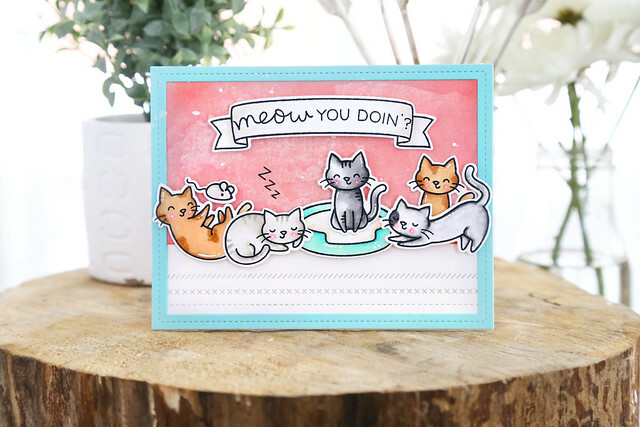 The kitties from Meow You Doin' have the best poses! I love the stretching one the best. I paired them with a few rows of Stitched Borders and popped the sentiment into a banner from Bannertastic. Check out the LF blog for more inspiration this morning - click! It's day 2 of this month's Neat and Tangled release week. 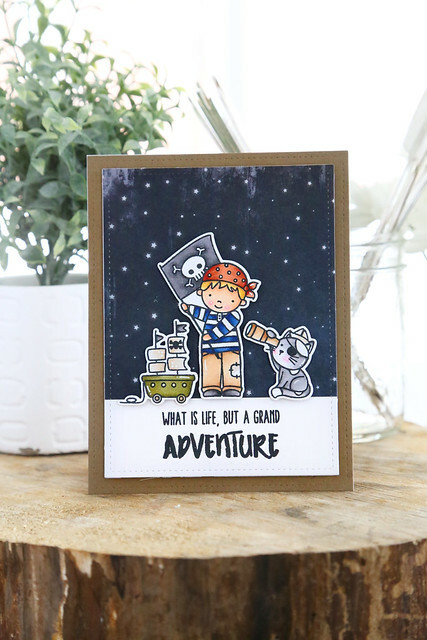 Today, we're showing off Tiny Cuts, a set of teeny tiny dies that can pack a big punch. 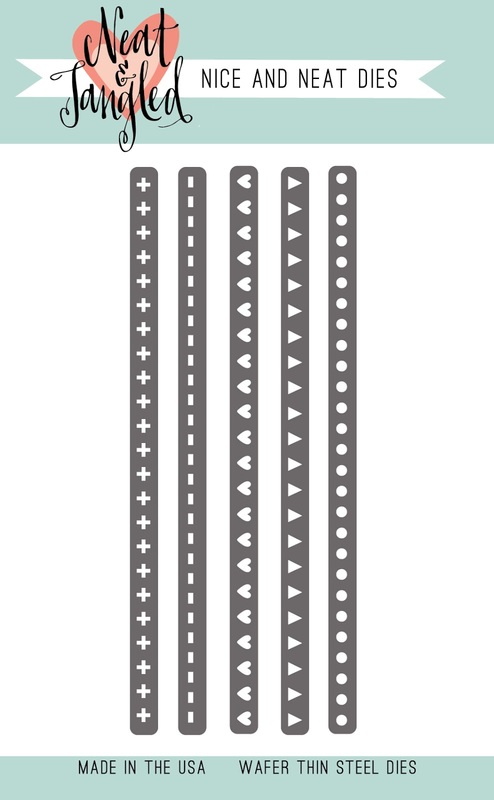 These little die strips come wired together, so you could have 5 rows of perfectly spaced out cuts, but I cut them apart so that I could cut just the little cross design. I hope you like it! 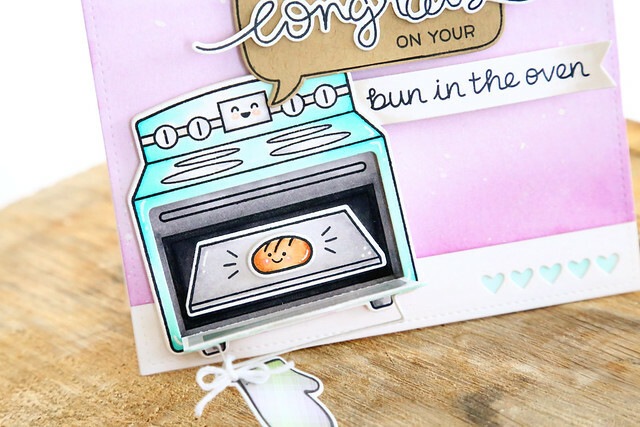 Visit the NT blog this morning to see what the rest of the design team did with these little dies - click! 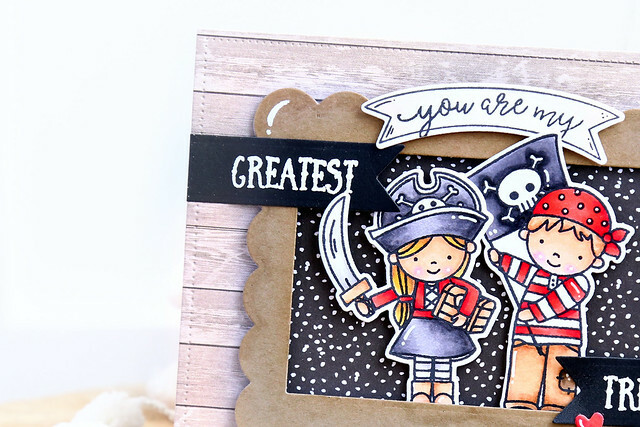 We're kicking off this month's Neat and Tangled release week with a closer look at my new set, Yo Ho Ho. I love cute pirate illustrations, and I added a quirky touch with these - I wanted to make it look like they were kids playing dress-up with their pets! I added a string to the toy ship to make it look like a toy too. I made 2 cards to share with you today. For the first, I paired some of the images with a sentiment from the previously-released Topography. They pair so well together! 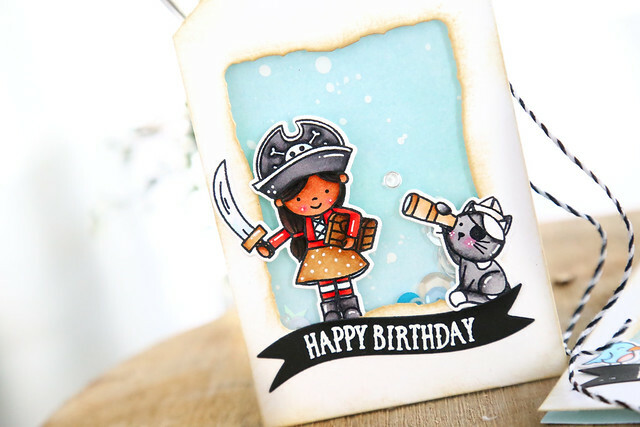 The little cat with the spyglass is my favorite. The little fish jumping out of his bowl, the stuffed parrot resting on the brim of her hat, and the cat clearly having his eye on that bird - makes me smile! I heat-embossed ARRR, and then spelled out M-A-T-E-Y using the Journaling Alphas dies. I'd love to know what you think of this set! And don't forget that leaving a comment on all of the design team blogs will increase your chances to win a 25$ gift certificate to the NT store. Visit the NT blog to see more - click! 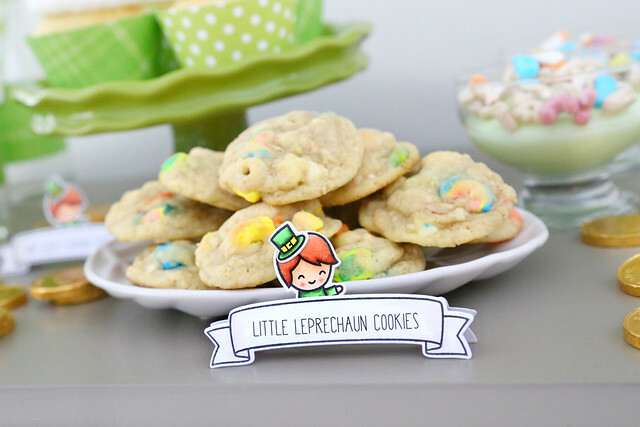 I don't normally decorate or pay any attention to St-Patrick's day, but we were walking through the grocery store and I was hungry and Maia was begging for a box of Lucky Charms cereal. gah! So I went ahead and made her separate all of the marshmallows from the cereal in the entire box. That bought me a whole hour of precious silence. I didn't even say anything when I saw her sneaking a marshmallow here and there. I still had enough of them left for cookies, cupcakes and pudding. 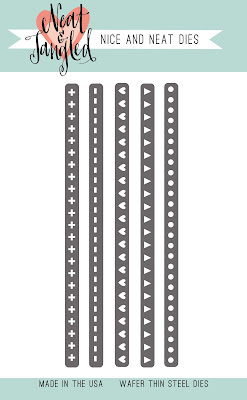 I created the little labels by printing out the names of the desserts, and then stamping a banner from the new Lawn Fawn set, Bannertastic. I made it stand up by creating a folding banner label, adhered to the back. The little boy from Bicycle Built for You was easily turned into a leprechaun with the right coloring and a little drawn buckle on his hat. Back to the cookies. I want to say they were amazing, but they were mediocre. Not bad, just not a great cookie. I mean, obviously. 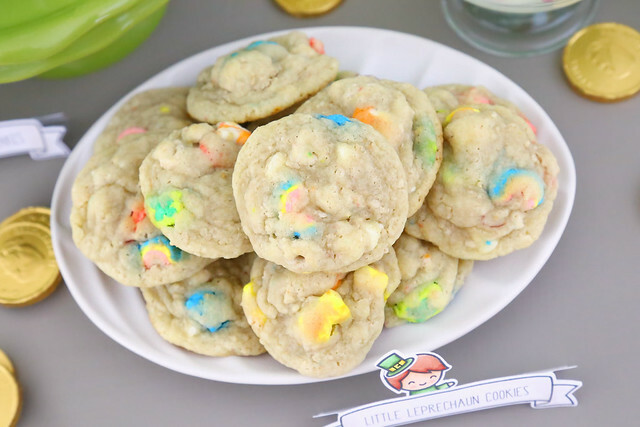 There is crushed up cereal in the batter. But the kids thought they were great fun, and loved the pretty colors peeking through. If you want to take a chance and make them yourself, here's the link: click! 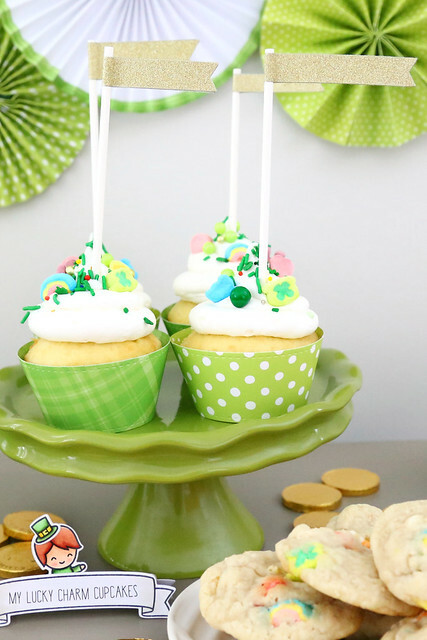 The cupcakes got dressed up in pretty green wrappers, and little gold flags, cut with Lawn Fawn's Everyday Sentiment Banners. I sprinkled the tops of the cupcakes with Lucky Charms Marshmallows and these amazing sprinkles. I am a little obsessed with them. 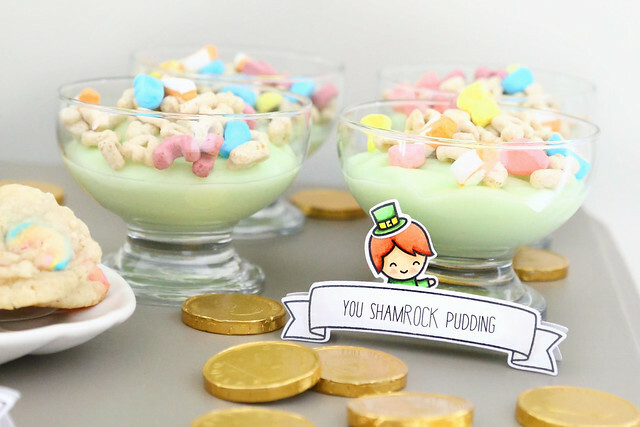 I also used Lucky Charms cereal to decorate the tops of the Sham-ROCK puddings. Vanilla pudding dyed green. Pretty basic, but it brought the cousins knocking on our door. I love that I didn't even make the Top O' The Morning Milkshakes to show you, haha. 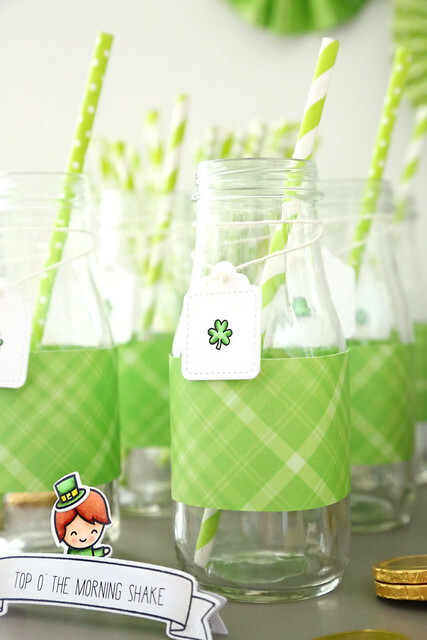 I dressed up the milk bottles in the same green papers as the cupcake wrappers, and added a tiny tag stamped with a single shamrock on each one. I'll fill them for the kids on St-Patrick day with a nice, healthy green smoothie. 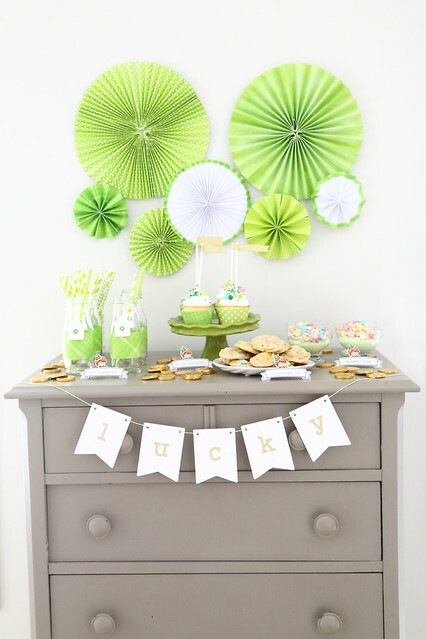 The backdrop was made using Lawn Fawn papers too! I tried my hand at making a paper fan background by scooping out all of my green papers. The biggest fans used up 3 12x12 papers each. Apart from needing to press down the folds more tightly, I love how they turned out! I'd love to know what you think! Thanks for stopping by!